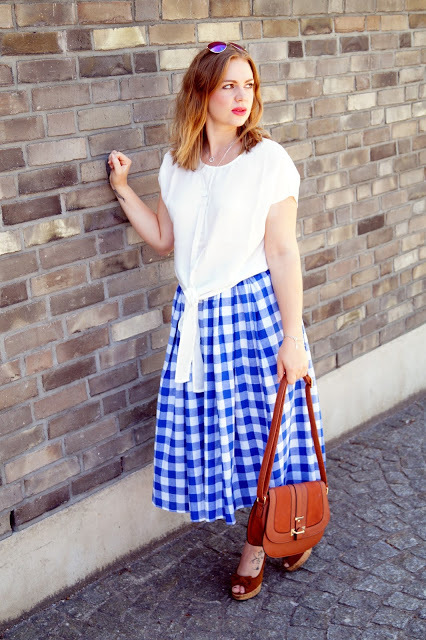 How I styled a blue and white gingham midi skirt for summer from SheIn…. 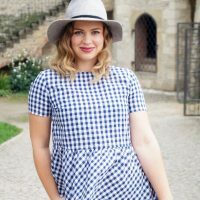 since gingham is one of my favorite prints and one of the IT prints for summer I just can´t get enough of it (also got a few gingham pieces for fall already). 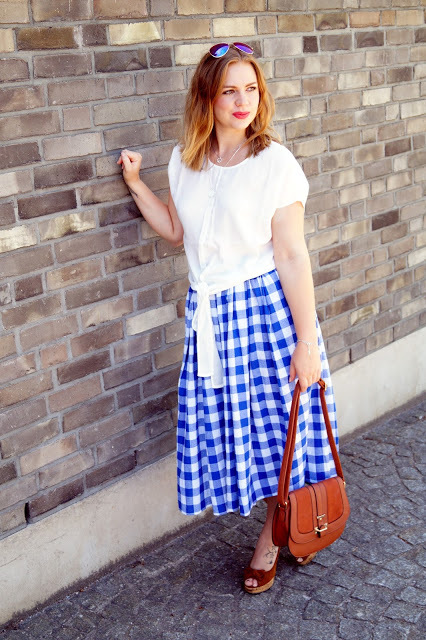 I got this beautiful summer midi skirt from SheIn a few weeks ago and already wore it twice. The print and the length got me immiately and when I read that it had pockets I was completely sold. 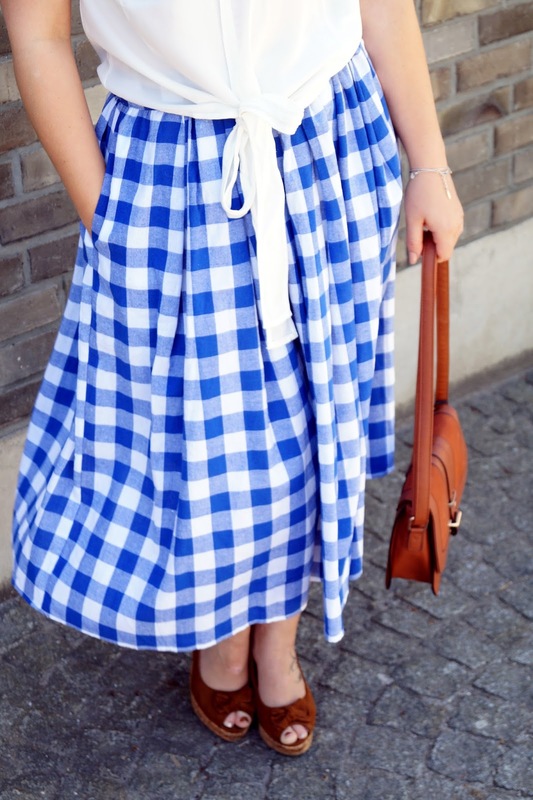 I paired it with a white shirt cause I wanted to have the focus on this beautiful and bold blue color the skirt is in. A few accessories in a hip and trendy cognac brown shade (this color goes with everything) and a pair of matching sunglasses and we headed out for some lunch. Do you have any plans for the weekend ? We started to think about what to do this week since there are no apointments. 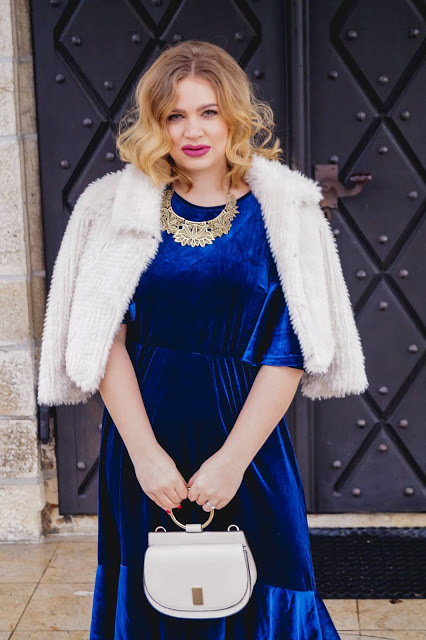 I definitely want to shoot 2 or 3 fall looks on Saturday (all the fall items I picked got in and there are definitely some I am keeping) and after renouncing carbs for so many weeks now I definitely want to grab a burger this weekend. Designer Dupe for the Céline Medium Luggage Phantom handbag and a floral a-line skirt…. The olive green parka and the scarf every blogger is wearing at the moment….